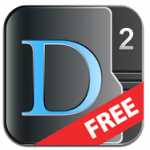 DOCUMENTS 2 FREE is an office document viewer, and also opens up other files like PDF, image files, web pages and sound files. You can edit text files and save them to your device where you can upload it to Google Docs, email it as an attachment, or print it to your wifi printer (although the print didn’t seem to work in the free version). You can send documents to your device through a web browser to the IP address listed at the top of the app’s page. If you are going to view or edit a file from Google Docs, you are going to have to download it first before you can view or edit it.You can even group your documents into a folder to better organize your files. This app also has an integrated photo album and even a sound recorder. You can use this app in either portrait or landscape views. You have full functionality of spreadsheet options like the sum of a line or column and even cell formatting. This will work online or offline which does help if you are unable to access the internet when you are on the go. You can view a vast arrangement of files like Microsoft Word (.doc, .docx), Microsoft Excel (.xls, .xlsx), Microsoft PowerPoint (.ppt, .pptx), Images (.jpg, .jpeg, .tif, .gif, .svg), iWork (Pages, Number, Keynote), Adobe Acrobat (.pdf), Web Pages (.htm, .html), Web Archive (.mht), and Audio (.mp3, .wav). You will note that the paid version of Documents 2’s page says ” ? ONLY $1.99 FOR TODAY ? ?? THAT’s 80% OFF ? ?,” but it should be noted that this has been $1.99 since 2/1/2010 so it is safe to say that the price won’t go up since it has been updated multiple times since the price drop. That is unless they want to change it back to a higher price later so if you are interested in this it might be a reasonable price to view and edit files with this app. Although it should be noted that the free version has no way of changing to another tab in the spreadsheet viewer. If you only are using the one tab then you are fine otherwise it’s just not going to work for multiple tabs. 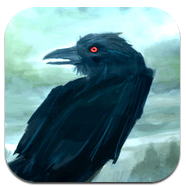 The Raven by Edgar Allan Poe is an interactive ebook that you are able to either read the book or read to you with the included voice of the person reading the poem. This app comes complete with incidental music and even still illustrations to enhance Poe’s poem to another level. The only thing the app doesn’t tell you other than the app’s page on iTunes is that you can shake your phone in order to go back to the main menu. 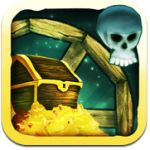 Wheeler’s Treasure is a side scrolling platform game that is unlike other games of this genre. Instead of walking and jumping, you are doing just that while you are inside a rolling wheel. This wheel is your lifeline. If you roll it into lava it will burn, and if you get hit by cannonballs it will remove a section of the wheel a little bit at a time. At the beginning of the game you get a feel of the game with the tutorial as you are playing and even shows you about repairing the wheel before you start using it so it should have the option of repairing the wheel eventually. If you lose all the pieces of the wheel, the game is over. Every time you play the game it randomly generates the world so it will be unique every time you play. You can grab 18 items throughout the game as well as collecting the coins as you progress through the game.